One of the most difficult concepts to understand is how to measure the brightness of light. This is difficult because the human eye is more sensitive to some colors (frequencies) than others, thus perceiving some colors to be brighter than they actually are. The human eye is more sensitive to the colors in the middle of the spectrum of human visibility (yellows and greens) than those at the limit of the spectrum of human visibility (reds and blues). 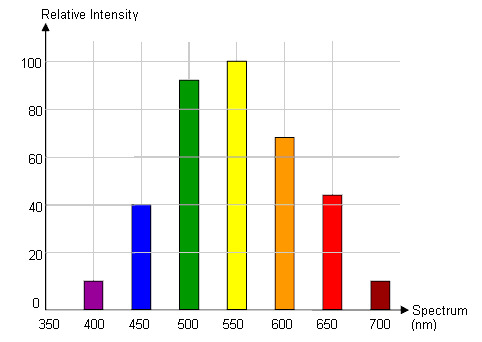 Below is a graphic representation of the relative intensities of the spectrum. Understanding that the human eye has a varying sensitivity to "brightness" leads scientists to the use the expression Luminous Intensity when referring to how much light is given off by a certain source. Due to the discrepancy between these relative intensities, the scientific community has never related luminous intensity with units in the SI (standard metric) system. In an effort to be more exact, luminous intensity is now measured as a unit of power, or power radiated outward from a luminous source. The unit used is a candela which measures the wattage emitted within a specific angle. 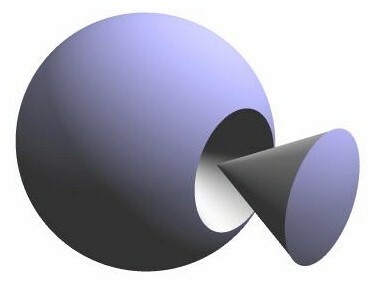 If you take a sphere, inscribe a cone with the tip at the center of the sphere and its base along the surface of the sphere, then the solid angle subtended when the area of the surface is equal to the square of one of the legs is called a steradian. A candela is the measure of luminous intensity that is radiated outward from this angle. However, the candela only measures the luminous intensity of the source. The candela does not care about what happens to the light after it leaves the source. For measuring light as it travels through space we use the term lumen. Lumen is derived by taking the candela measure of the source and multiplying it by solid angle (steradian) through which it is being emitted. The lumen is used for measuring light as it travels through space. In order to measure the luminous intensity of a light source on an object we divide the number of lumens by the area over which the light is shining. This unit is called lux. Lux is how we measure the luminous intensity of a light source on any surface area. We reference light intensity when designing our windshield.